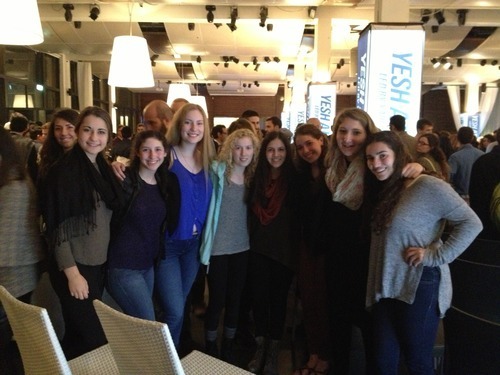 AMHSI students at Trask at the Tel Aviv Port to Hear Yair Lapid. On Sunday evening, December 21st, AMHSI students had the opportunity to hear Yair Lapid, former jounalsit and current chairman of the Yesh Atid party, speak at an event to garner the votes of English-speaking Israelis. Over 1000 people attended the event. The event was co-sponsored by Yesh Atid and the International Salon, an organization that arranges lectures by high profiles figures for the English-speaking young professional community in Tel Aviv. One of the founders of the Salon is Natalie Solomon, who attended AMHSI during the summer of 1999! AMHSI students were able to avoid the large crowd, enter through the press/groups entrance and reserve good seats thanks to Natalie! During the event, Lapid warned attendees regarding what could happen should Netanyahu stay in power, such as, reallocating monies from the middle class and students and canceling Yesh Atid initiatives including, limiting the number of ministers and an extended daylight savings time. He also mentioned that the party will not be revealing it’s list to the public until the last possible moment. It is speculated that this may be due to the possibility of a merger with the new policitcal party, Kulanu, headed by former Communications Minister, Moshe Kachlon.